(1993-02-05) Donated by the Celeste and Emil Richards Estate. Huichol Ceremonial DrumA hollow cylindrical shell of any size that has a head stretched over one or both ends and is b.... Note the square holes, which run directly through the entire body of the drum. Native to the Sierra Madre Mountains in Mexico, the Huichol Native American Indians descend from the ancient Aztec culture and strive to continue their cultural heritage in its pure state. Currently having a population of about 15,000, their culture has roots based on shamanism, a tradition that uses the drum as an element in worship and ceremonial activities. The drum is seen as a central figure in their art, often in conjunction with representations of various deities (such as the God of Fire during the Harvest of Corn Ceremony) as the shaman is performing on it. Constructed from a hollow log, this drum is carved so that the bottom portion of the drumshell is shaped into three “feet,” and is therefore assigned to the category “footed” drums. The use of this design allows the drum to sit on the ground while being played, yet still allows the air from striking the drumheadThe covering or membrane, made of animal skin or synthetic plastics, that stretches over the dr... to escape from the open bottom to aid the drum’s resonance. 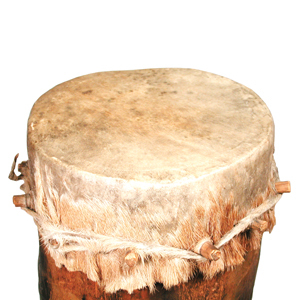 It is a common design of native drums from many parts of the world, including North and South America, Africa, and the Orient. A single deerskin head is attached to the upper portion of the log by twelve wooden pegs, which are interlaced with a single deerskin cord. Hair from the hide, while scraped clean from the striking portion of the drum, is left intact on the sides, or non-striking portion. 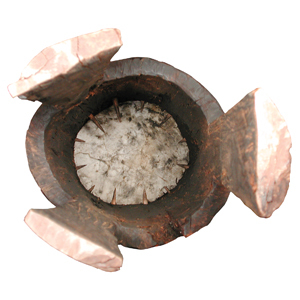 Inserted horizontally, the pegs do not allow for tuning of the head, and as a result the drum is often tuned by heating over a flame or coals. Two square holes are burned through the side of the shellThe cylindrical body of the drum, usually made from plywood., allowing a square rod to be inserted for the purpose of positioning the drum while heating, and for the use of the drum over a fire during ceremonial performances. Other symbolic items are sometimes attached to the drum during the Huichol ceremonies. The drum is approximately 9 1/2 inches at its widest point, and stands 23 1/2 inches tall.